This site reflects my personal opinions and not those of my employer or anyone with more sense than I have. Choose Your Own Adventure: Which Eucalyptus UI is Right for You? Open source projects can often lead to an embarrassment of riches that can really be confusing. This is especially true when it comes to tools you can use to interact with your Eucalyptus cloud. Options include CLIs, SDKs, and different graphical user interfaces. Each has advantages and disadvantages, strengths and weaknesses, and is targeted to a specific kind of person. Depending on what you want to do, your level of cloud knowledge, and the kind of user experience you desire, there is a Eucalyptus UI that will fit you perfectly. Let’s take a quick look at each and then you can Choose Your Own Adventure to help you find your ideal fit. The Eucalyptus User Console is an open source project with development primarily done internally by Eucalyptus employees. We wanted to give our customers a graphical user interface for self-service deployment of virtual machines on Eucalyptus clouds that had a first-class user experience. There were many full-featured, open-source options available. None of them offered the simplicity, modernity and ease of use we were looking for, so we decided to build our own. 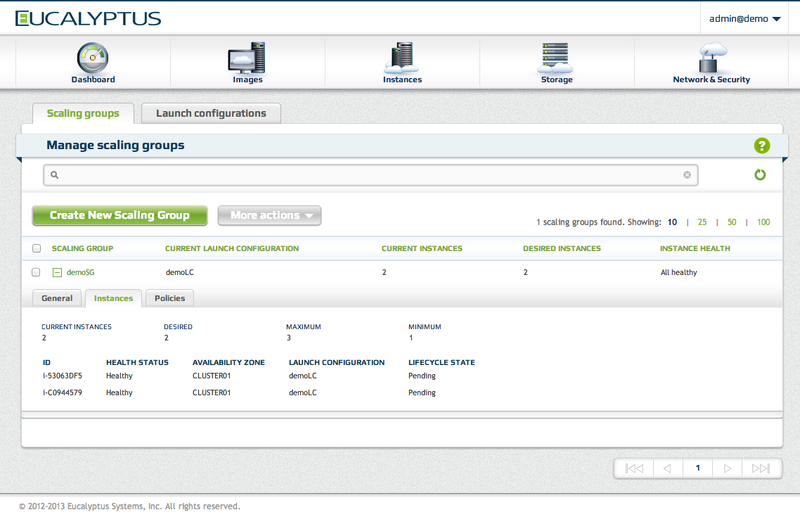 The Eucalyptus User Console is easy to use, especially if you are familiar with AWS. 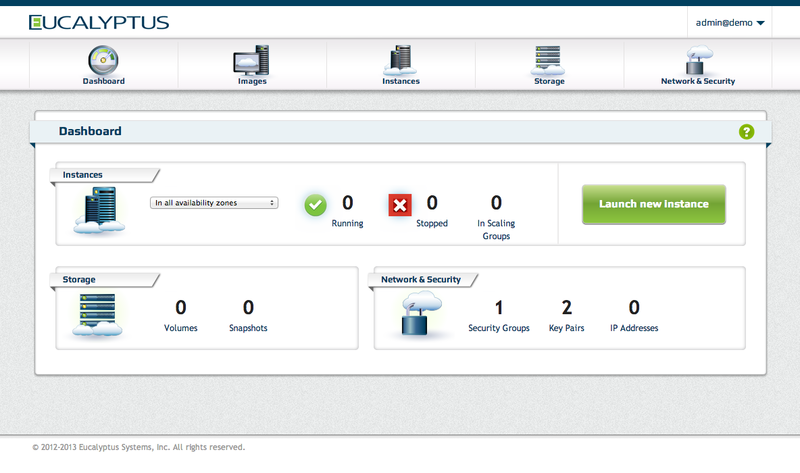 We consciously chose to keep this console somewhat similar to AWS to make the ramp-up for new users very intuitive. However, improvements have been made, especially in the area of workflows. In the process of defining a virtual machine instance and realize you have not defined a security group or key pair that you wish to use for that instance? No problem, you can define those resources from within the Launch Instance Wizard. Creating a security group and defining ingress rules for that security group are located within the same dialog. 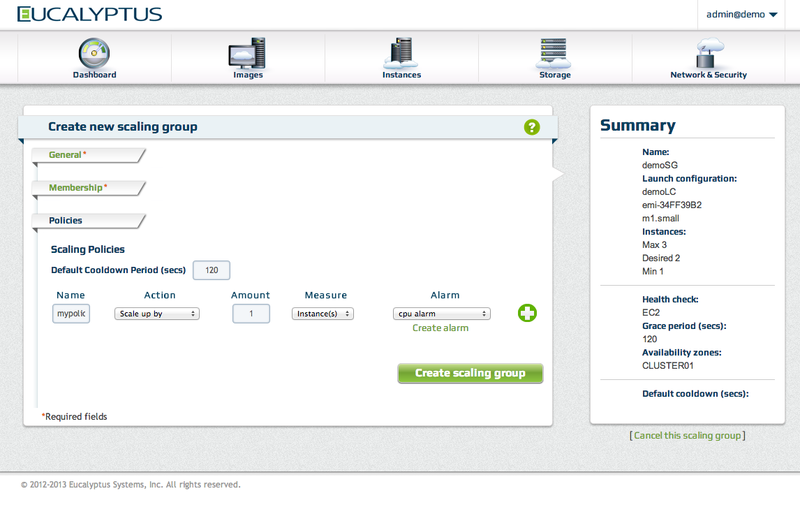 Want to define a policy that will scale a security group based on CloudWatch metrics and alarms? You can do all that from within the Create Scaling Group Wizard. The Eucalyptus User Console offers superior ease of use, simplicity and workflows, but because the team is small and it is a relatively new project, it is not as full featured as other available options. You can manage all your EC2 resources, Autoscaling Groups, and upcoming in the 3.4 release, you can use it to manage AWS resources as well. However, if you want to manage Walrus/S3 buckets or Elastic Load Balancers, this is not yet the tool for you (it is open source, though, so please feel free to contribute!). IAM account management is on the roadmap for an upcoming release, as is Elastic Load Balancing and an embedded SSH client to allow access to virtual machines without needing to install a separate client tool. We recommend this tool for those new to Eucalyptus or cloud computing, and those who want the most ease of use but either don’t need or can wait for the full feature set to be implemented. As Eucalyptus added new features in the 3.3 release (Autoscaling, CloudWatch and Elastic Load Balancing), development on the back end outpaced development of the Eucalyptus User Console. Our QA team needed a graphical way to test these features against AWS for API compatibility, so they forked the ElasticWolf open source GUI (which is maintained by Amazon employees) and added support for Eucalyptus resources to that interface. Thus the Eucalobo project was born. 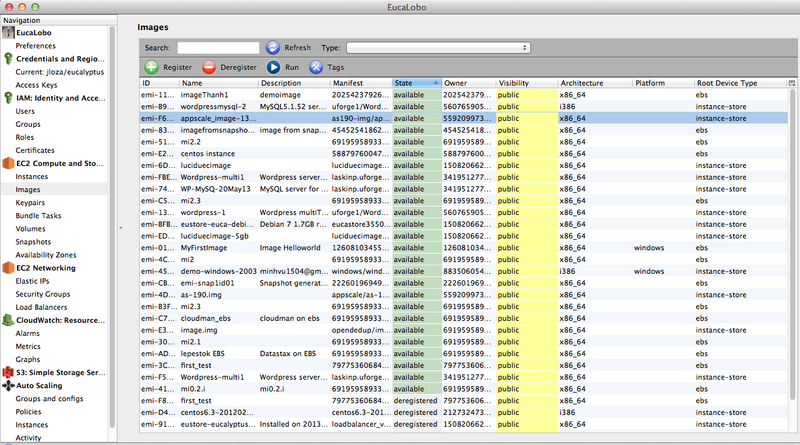 Eucalobo is more full-featured than the Eucalyptus User Console. It supports AWS resource management, Autoscaling, Elastic Load Balancing, IAM user management. S3 and CloudWatch graphs in its current release. However, Eucalobo is not easy to use, nor does it contain guardrails to help protect users. It does not help users easily complete all the tasks required in a workflow to achieve their goals. We recommend this tool only for the most experienced users, who need all the features Eucalobo provides in a graphical interface and care less about ease of use and simplicity. If you know exactly what you need to do and how to do it, and want a GUI that is akin to the CLI tools, Eucalobo is the right tool for you. If you need access to all the features Eucalyptus provides and want to script things to simplify your workflows or integrate into your other management systems you currently use, or simply don’t prefer a graphical experience, Eucalyptus offers a full-featured set of command line tools for you. Euca2ools works with Eucalyptus clouds and with AWS, and in fact is a very popular command line option for those who wish to manage AWS and don’t use Eucalyptus. For administrative tasks on the Eucalyptus platform, we provide administrative CLI commands. The CLI is the best option for those who want access to all the features in Eucalyptus and/or AWS clouds without the need for a graphical interface. To truly “create you r own adventure,” and integrate Eucalyptus into your current workflow tools, we support the AWS SDKs. This allows you to provide a tailored experience for your users that you maintain and control. In the end, you can decide exactly which UI is right for you. Hopefully these explanations will help you on your journey. We welcome feedback and comments. If you have questions or feedback on any of the options listed, please let me know! Whichever UI adventure you choose, we are committed to making your journey as smooth as possible. This entry was posted in Eucalyptus and tagged Eucalobo, Eucalyptus, Eucalyptus Console, graphical user interfaces, open source projects, UX by jennyloza. Bookmark the permalink. Reblogged this on Testing Clouds at 128bpm. Reblogged this on shaon's Blog. Thanks for your comment! HybridFox is also an excellent option. I would target it toward the same user profile that would do well with Eucalobo. Is the EUCAUI a stand alone product?